I can’t get enough of this holiday baking stuff. Like, for real. I have a problem. I think of new recipes I want to try, just about everyday. I’ve realized the possibilities are endless! Now it’s just a matter of turning those recipes into gluten, dairy and egg free delights. That’s the challenge! My kids love any dessert that is frosted and has sprinkles. I’m pretty sure most kids are that way. Add frosting to a cookie and in their eyes, it just became the best cookie ever. 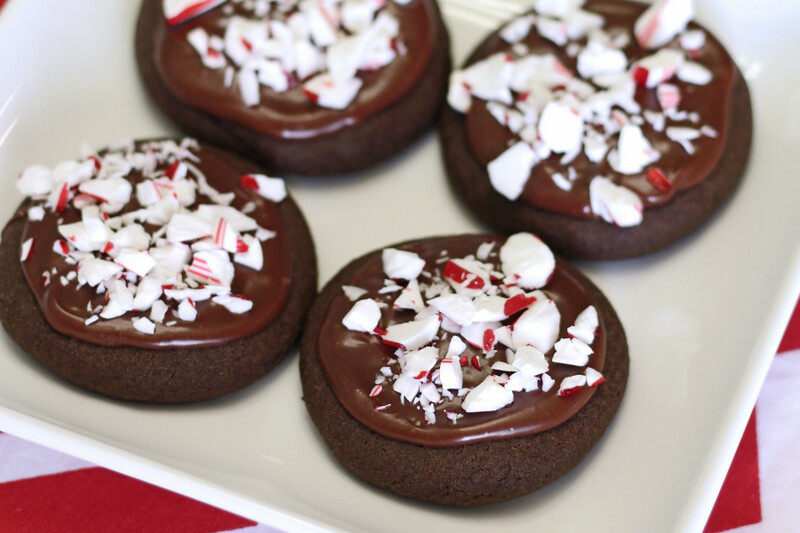 I knew I wanted to make a frosted chocolate peppermint cookie. To take it one step further towards deliciousness, I crushed up a few candy canes and sprinkled them on top. Soft gluten free chocolate cookies. Creamy chocolate peppermint frosting. Crunchy peppermint topping. A new tasty recipe for your next holiday party or cookie swap! In medium bowl, sift together flour blend, cocoa powder, baking powder and salt. Set aside. In large mixing bowl, mix together powdered sugar, melted chocolate chips, melted coconut oil, coconut milk, vanilla and peppermint extract. Beat until smooth. Add the flour mixture. Stir until combined. Refrigerate dough for 30 minutes to one hour, just to chill. Roll tablespoon-scoops of cookie dough into balls. Flatten to about 1/3" with bottom of glass jar or fingers (cookies won't spread much). Bake cookies for 8-9 minutes. Remove from oven and place on cooling rack to cool completely. To make chocolate frosting, place chocolate chips and coffee creamer in microwave safe bowl. Microwave on low in 30 second intervals (stirring in-between). Add powdered sugar, vanilla and peppermint extract. Whisk together until smooth and creamy. If frosting starts to get hard, just microwave on low for 15 seconds. Frost cookies with frosting and sprinkle with crushed peppermint candies. 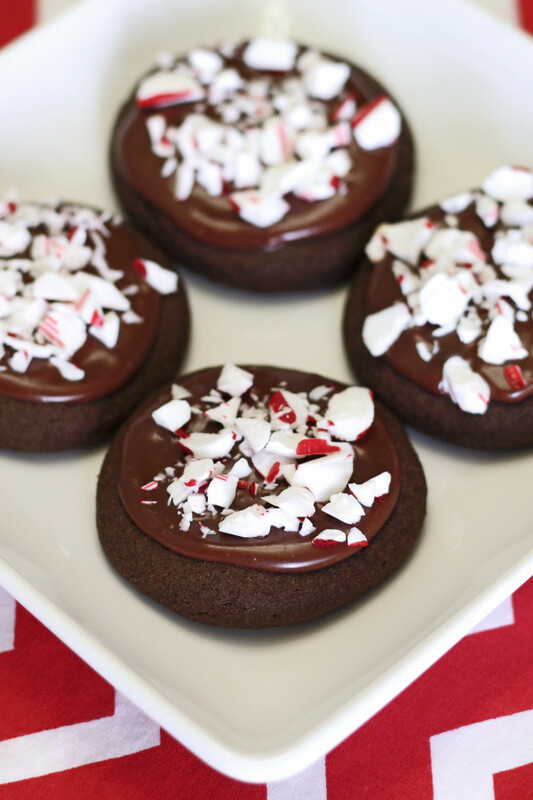 Best served within 1-2 days (peppermint candies may become soft). what can I use instead of coconut milk & coconut milk coffee creamer? You can try using almond milk or soy milk. I have only used coconut milk so I can not guarantee the results with changing to a different milk. 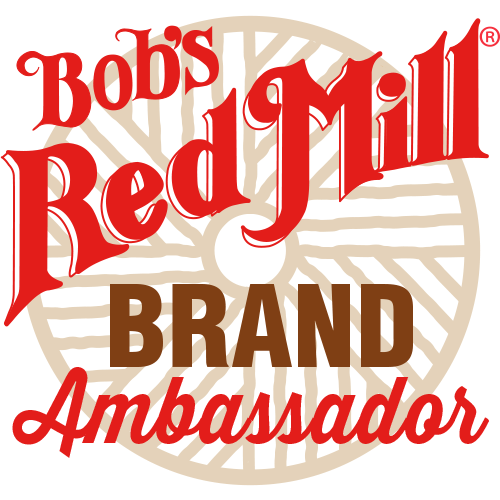 Let me know if they work for you!